When you are a caregiver to an elderly loved one, it is normal to worry about their safety and physical wellbeing. Even the healthiest of seniors lose some of their physical abilities as they get older. Often, many of the daily activities they used to carry out with ease can become difficult and even dangerous for them. Anyone, at any age, can slip during a bath or shower. The wet and slippery surfaces can be tricky to manage regardless of your fitness level. Maintaining good balance during a bath can be even more difficult for seniors. It is not uncommon for people to lose their footing and fall in the bathroom, hitting their heads, or breaking glass shower doors and cutting themselves with the shards. Razors and shaving machines can also cause injuries. Falling down in the bathroom can be especially dangerous because we tend to be alone when we take a bath or shower. And, the door is usually locked too. This means that it might be hard to realize someone has fallen down and it could be difficult to reach them if they get hurt and can’t unlock the door. Even a few minutes can make a huge difference when we are in an emergency and in urgent need of medical assistance. That is why it is so important to minimize risks inside your bathroom. You need to make it safer for your loved one to take a bath or shower without slipping or falling down. Non-slip bath mats ar extremely helpful for seniors and the elderly. They allow them to maintain their personal care routine without any safety concerns which boosts their confidence and independence. Knowing that they are safe will also take a huge weight off your shoulders. Suction cups: mats with numerous suction cups on their bottom surface will be less likely to slip around on your bathtub or shower. 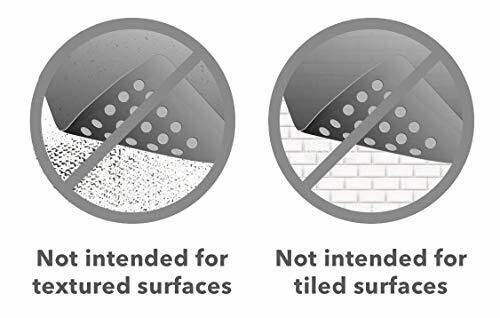 Textured surface: it doesn’t matter which kind of texture you prefer; as long as your mat isn’t completely smooth, it will make it easier to keep a firm footing while taking a shower. BPA-free: these days, most of the mats you’ll find are BPA-free, making it easier to keep your home free of harmful chemicals that could negatively impact your health. 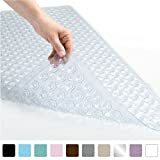 Antibacterial properties: go for a non-slip shower mat for the elderly that has been coated with antibacterial agents, which will keep it protected from mold and mildew. Machine washable: being able to throw your bath mat into the washing machine is a huge advantage when it comes to keeping your bathroom clean and tidy. Drainage: look for a bath mat that has drainage holes to make sure water doesn’t stay pooled over it, keeping it dry and clean. Perfect size: make sure every inch of your shower or bathtub is covered and safe by buying a mat that fits perfectly. This bath mat might just seem too good to be true especially considering the price. 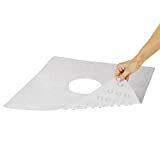 This mat measures 39”x16″ and will cover the entire surface of a standard-size bathtub while its 200 suction cups will keep safely in place. It has been treated with antibacterial products in order to avoid mold, mildew, or harmful bacteria growth. The fact that it is machine washable will make it easier for you to keep it clean. There are 174 drainage holes to ensure it stays dry and doesn’t collect residual water. It’s also BPA and allergen-free, curl-free, and features a cushioned, textured surface. Choose from 4 colors to match the rest of your bathroom. It is meant to be used only over smooth surfaces and won’t adhere to textured bathtubs. Reviewers have praised this mat for its powerful grip, comfortable texture, and how well the drainage holes work. Most reviewers agree on the fact that the blue or white options are the best, since clear plastic tends to discolor and turn yellowish after a few months. Several reviews also point out that the mat does indeed cover the entire surface of their bathtubs, and that it doesn’t leave any bare spots. 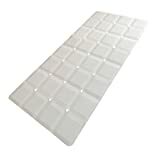 This is the best bath mat for shower stalls because of it’s 22″ square shape. It should easily cover the entire surface of a standard-size shower. It features 200 individual suction cups that attach the mat and keep it in place even after it gets wet. The mat’s surface is lightly textured and treated with antibacterial agents to keep it clean and free of mold and mildew. Instead of having numerous small drainage holes, this mat has one central hole that matches the shower’s drain to eliminate pooling water. Many reviews praise its soft and comfortable texture, and highlight the fact that it doesn’t collect mold or mildew even after months of use. Many of the customers who have bought this mat point out that they use it to keep themselves and their elderly loved-ones safe while taking a shower. Some even use it to place a chair in the shower if they are unable to stand for long periods of time or are recovering from a surgical procedure. 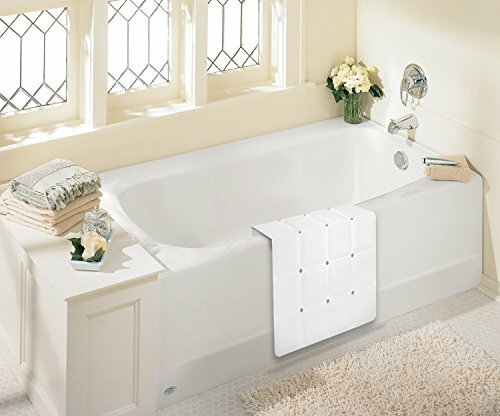 This is another great mat for bathtubs or larger showers. It measures at 35″ x 16″ and provides excellent coverage that won’t leave any exposed spots. The 324 suction cups will ensure excellent footing and stability while you take a bath or shower. It also features small drainage holes throughout its surface to ensure water doesn’t pool over it. I also like that it is BPA and phthalate-free, and non-toxic. Its antibacterial properties will keep it free of mold, mildew, and harmful pathogens. You can toss it into the washing machine at any time for a quick clean up. It isn’t meant to be used for textured surfaces. And, The manufacturer also warns that using bath oils can cause the mat to slip around. It comes in clear, green, and pink plastic. Reviewers have praised the mat’s comfortable texture, and its many suction cups and drainage holes. Many reviews claim that the suction cups are powerful enough to keep it secure even when placed over slightly textured tubs or showers. They also appreciate the fact that it comes out of the washing machine looking brand new, which makes it hygienic and durable. Although some do report that the mat becomes discolored after being in place for a few months. This is the best bath mat for textured surface tubs. So, it doesn’t have suction cups because it is meant to be placed on these textured surfaces. So, if you have a textured tub or shower, this could be the perfect option for you. It comes in two sizes, 28″x14″ and 36″x17.7″, which will make it simpler for you to choose the option that will fit your tub or shower best. You can also choose from three neutral-colored options: white, gray, and taupe. It features a foldable design that will allow you to store it easily or fold it at the edge of the tub while not in use. Additionally, its honeycomb texture surface will provide you and your loved ones with a secure footing. It also features lots of drainage holes that turn this mat into a clean, fast-drying option for your household. Reviewers have commented on the fact that this mat works great with reglazed bathtubs. This is because mats with suction cups can damage the finish applied to those tubs. They also appreciate the fact that, despite the lack of cups, this mat is sturdy and stays put. No floating or moving around! These are only some of the best non-slip bath mats for the elderly that you can find online. There are many more options available and you will certainly be able to find one that suits you and your bathroom perfectly. These mats are an indispensable step in making sure that your elderly loved one is safe while taking a bath or shower. Combine these mats with a tub transfer bench for non-slip bathing and showering. It’s amazing how such a simple item can allow you to feel confident that they are safe while they carry out their usual self-care routine. For other ways to maker bathing safer for seniors, check out my guides to choosing the best shower chair and using safer handheld showerheads. All my bathroom safety guides can be found here. How have you kept a senior safer in the tub or shower? Feel free to share your tips and ideas in the comments below. And, if you found this article helpful, I’d appreciate a social share!